How to convert and import DVD content to iTunes. Q: How to convert/import a DVD movie to iTunes on a PC for personal use? iTunes, on one hand, is a media player app to play audios and videos, and on the other hand, a media library to download and manage digital music and video files on PC that runs alternatively on OS X or Windows OS, as well as on iPhone, iPad and iPod touch. Fast Convert DVD Disc to iTunes, Other Digital Video Format in MP4, H.264, HEVC, AVI, WMV, MPEG, MOV, ISO, etc. WinX DVD Ripper Platinum - [100% clean program] Best fastest DVD ripping software to easily convert DVD disc to digital video file in MP4, H.264, HEVC, MKV, AVI, WMV, MPEG, MOV, M2TS, ISO Image, iPhone XS/XS Max/8, iPad Pro/Air/Mini, Samsung Galaxy S9/Note 9, etc. on Windows (10) or Mac in about 5 minutes with original quality. Support ripping protected movie DVDs, newest 99-title DVDs, scratched DVDs, etc. iTunes is criticized for not being able to transfer music file from one portable device to another. Similarly, iTunes require the purchase of HD movies from iTunes Store. It does not support importing DVD video format like always, neither does QuickTime. What to do if we want to watch DVD videos instead of buying HD videos from Apple iTunes? To convert DVD to iTunes friendly videos, a good DVD to iTunes converter is a must for ripping DVD content to iTunes supported videos. 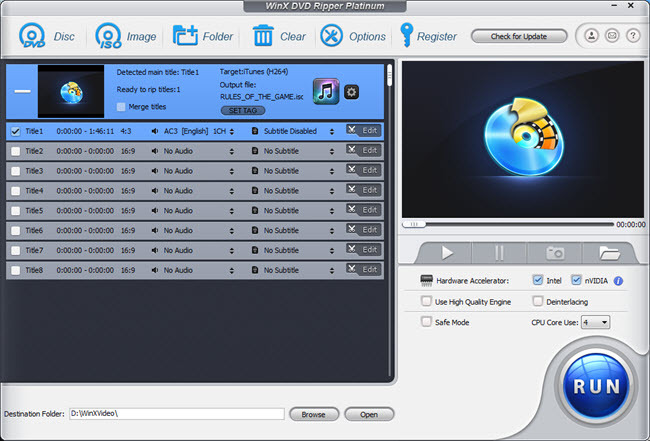 The upgraded and platinum version of WinX DVD Ripper with specialized profiles for iTunes is the best DVD ripper for iTunes (12/11). Update downloading, please install it on your computer and launch this DVD to iTunes ripper for PC. 1. Click on "DVD Disc", "ISO Image" or "Folder" button to this ripper. Then a smaller window will pop up. 2. Choose output profile in "Output Profile Category", and find "Apple Device" under "Device profile". Specific videos supported by different Apple and iOS devices will appear upon clicking on it. Among them, "to iTunes Video" is what you need. 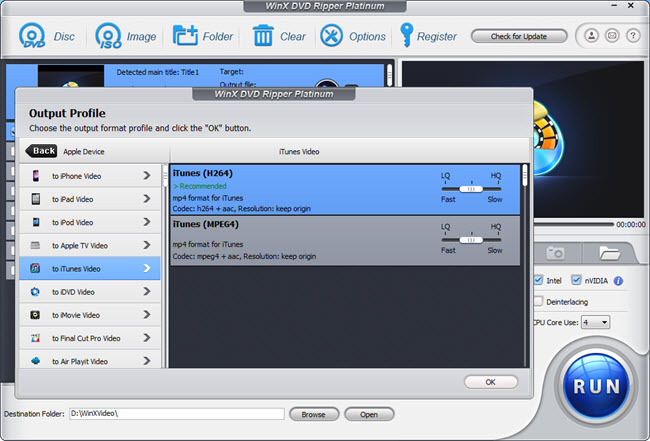 You may rip and convert DVD to M4V format for iTunes in Codec MPEG4 or H.264. For each, there are three different options to output LQ, SQ and HQ videos. You can slide to choose the idea one for you based on your requirement. The higher video quality is, the bigger output file size would be, and longer it will take to rip. 4. Click Run button to start converting DVD to iTunes 11/12 compatible video, which may first stored on your selected folder your computer hard drive. If you are sure you already have converted DVD video on Windows or Mac, you can transfer DVD video into iTunes (12) and then Sync DVD videos through iTunes (12) to iPad iPhone iPod. 1. Launch iTunes 12, add the movie video file to your iTunes library, create versions optimized for your device using the Advanced menu. 2. Click "Add to File" under "File" and browse and add the converted DVD video to your iTunes library. iTunes 11 will auto classify it in Movies category. You can play it directly on iTunes. 3. Drag the DVD movie to your iOS device including iPhone/XR/XS/X/8, iPod touch, iPad/Air//Mini/Pro from iTunes 12/11 LIBRARY. Or you may sync the video to iPad iPhone iPod. After that, you have successfully transferred DVD video from iTunes to iOS (12) device for playback. With WinX DVD Ripper Platinum or WinX DVD Ripper for Mac, you can have DVD videos in iTunes library as many as possible to enjoy HD videos without buying. It may help rip copy protected DVDs to iTunes on PC or Mac. Convert DVD Disc to Digital Copies in MP4, H.264, HEVC, MKV, etc.